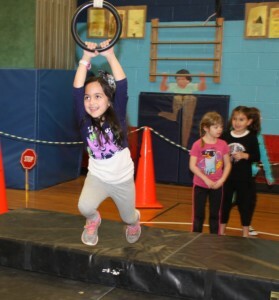 Commack Physical Education teacher Cathy Pugh comes up with some great themes for the annual “Safety City” unit at Wood Park Primary School in Commack. 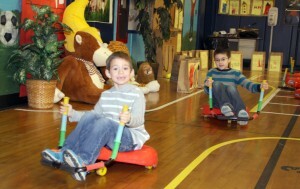 This year, she transformed the entire gym into a mini Commack town – complete with all the children’s favorite places. Students traverse the roads (Jericho Turnpike) on their scooters after “filling up” at a local gas station, being careful to observe all the posted signage. Then they’re off to climb trees at Hoyt Farm, go through tunnels and play games at a favorite restaurant center, bowl, swing through the air on rings at a local gymnastics establishment, run around the high school track, or play ice hockey. The roadways are lined with photos that students drew of their own homes, a surprise planned by Mrs. Pugh. A special thank you to the Wood Park lunch aides for helping the students draw pictures of their homes during indoor rec, to King Kullen for donating the paper bags for the pictures, and to Angela Perillo and Alex Calabro for their assistance with the set-up. Photo top right – Ava Javaheri works on upper body strength as she swings at the “local” gymnastics establishment. Photo bottom right – Ben Horsham and Luke Talerak “drive” around town after a stop at Hoyt Farm to see the animals.